Gift Cards are very popular Christmas gifts and everybody loves them!!! You can make your gift even more special by inserting it into this nice card holder! – Cut a sheet of Pool Party card stock in half lenghtwise. (4-1/4″ by 11″) – Using the Simply Scored Scoring Tool, score at 2 inches and 5-1/2 inches. – On the left hand side, cut half a circle with the 1-3/4″ Circle punch. – Fold on the lines you just scored. – Glue the top and bottom of the smaller folded part (where you are inserting the gift card). – Cut a rectangle in Island Indigo card stock 3-1/4″ by 3-7/8″. – Stamp snowflakes with Snow Swirled stamp set in Illuminate Glimmer ink. Adhere in place with Snail adhesive. – Cut 3 snowflakes with the Snow Flurry Bigz die and Big Shot. – Emboss the right hand side with the Delicate Designs embossing folder. – Adhere the biggest snowflake on your card with Snail adhesive. – Glue the smallest snowflake on the middle one with multi-purpose liquid glue. Adhere on the biggest snowflake with a dimensional. – Add a big pearl on top. – Color on the stamp “A gift for You” (from Beautiful Season set) with the Midnight Muse Stampin’marker. 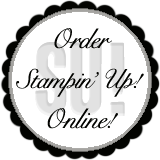 Stamp on Whisper White card stock. Cut with the Large Oval punch. Adhere on the card with dimensionals. Today’s project is a Wine tag with a Removable Keepsake Ornament! This make a nice Hostess gift! When you visit your friends and family this Holiday Season, bring a bottle of wine with a little something extra special! They can keep the ornament and hang it in their Christmas tree! 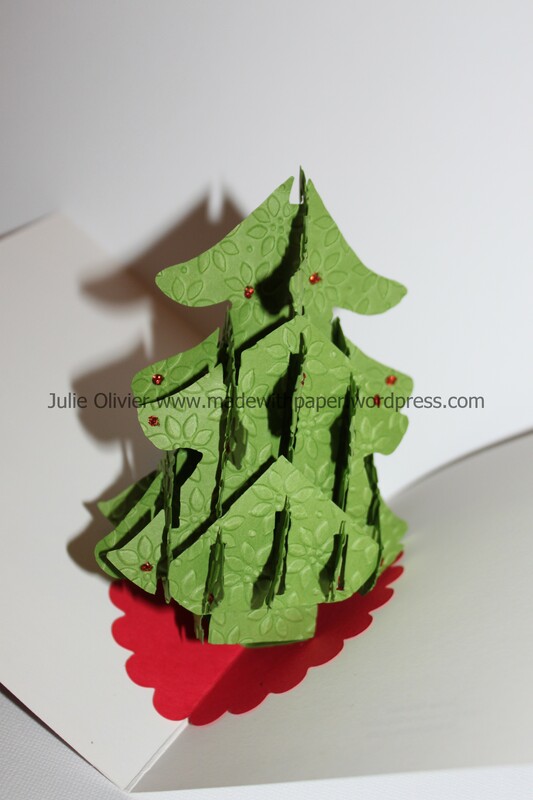 Cut 2 strips of 1.5 inch wide by 12 inches long in “Be of Good Cheer” Designer Series paper. Score every 1/2 inch on both strips. Glue the two strips together to form one long strip. Fold like an accordion, following your scored lines. Gather the center and join the two ends together to form a rosette. Glue your ends together using a Sticky strip. 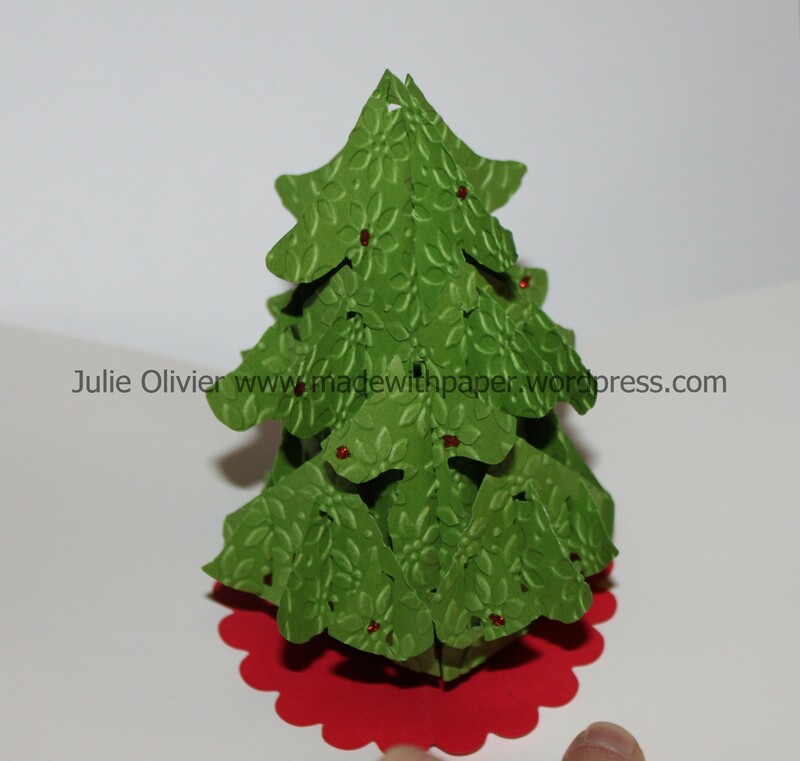 Cut 2 circles in Cherry Cobbler card stock with the 1″ Circle punch. Cover the circles with Multi-purpose liquid glue or sticky strips. Place in the center of your accordion, one on each side. Hold in place a few seconds until glue is set. Using the Big Shot and the Snow Flurry Bigz die, cut the 3 snowflakes in Whisper White card stock. Using the sponge daubber, sponge with Frost White Shimmer paint for a “sparkly” effect. Glue the snowflakes together using Stampin’ dimensionals. Add a Vintage Faceted Designer button and adhere with a glue dot. Add a big pearl in the center. Adhere the snowflake on your rosette. Add a small string to hang. Make the Wine bottle tag with a Cherry Cobbler rectangle of 6.5 in by 2.5 in. Stamp the snowflakes from “Snow Swirled” stamp set with Illuminate Glimmer Watermark Stampin’Pad. Punch a 1-3/4 ” Circle at the top. Score at 2.5″. Stamp “Joyeux Noel” in Cherry Cobbler ink on Whisper White card stock. Make the label using the Modern Label punch. Adhere with Snail adhesive. I made this card to thank someone for bringing her friends to my class. It really has the “WOW” factor when you open it! There’s a standing Christmas tree inside! This is a discontinued Bigz XL die but I really love it! It certainly take some time to make it but it’s always worth it! If you want to order one for someone really special in your life email me!!! After cutting all the parts of my Christmas tree, I embossed them with the Petal-a-Plenty folder and added some Cherry Cobbler Dazzling details. CS and paper: Whisper White, Cherry Cobbler, Gumball Green, Real Red, Merry Moments Simply Scrappin’ ” kit designer paper, Glossy White card stock.